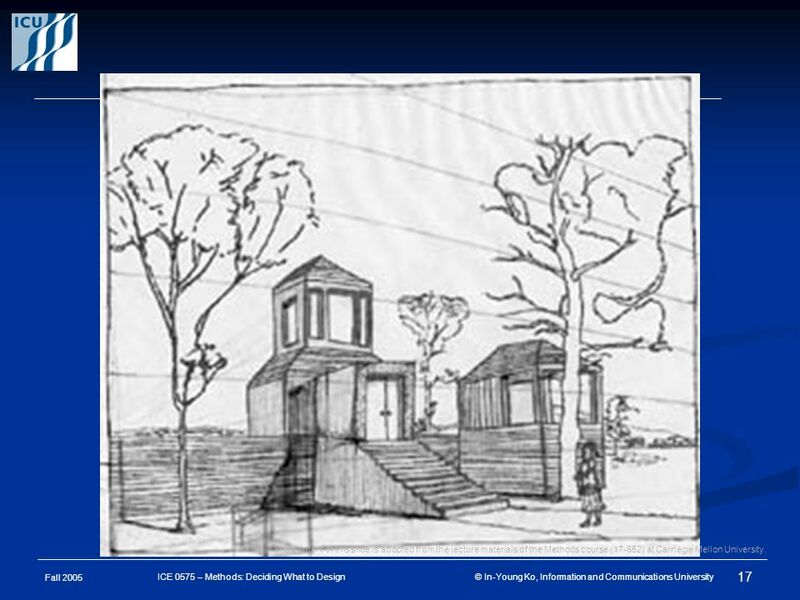 Methods: Deciding What to Design In-Young Ko iko.AT. icu.ac.kr Information and Communications University (ICU) iko.AT. icu.ac.kr Fall 2005 ICE0575 Lecture. 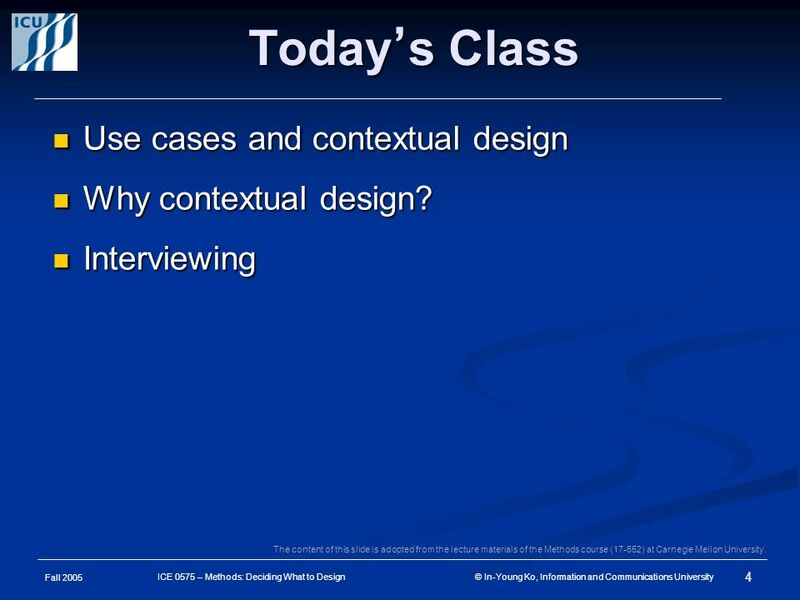 4 Fall 2005 4 ICE 0575 – Methods: Deciding What to Design © In-Young Ko, Information and Communications University Today ’ s Class Use cases and contextual design Use cases and contextual design Why contextual design? 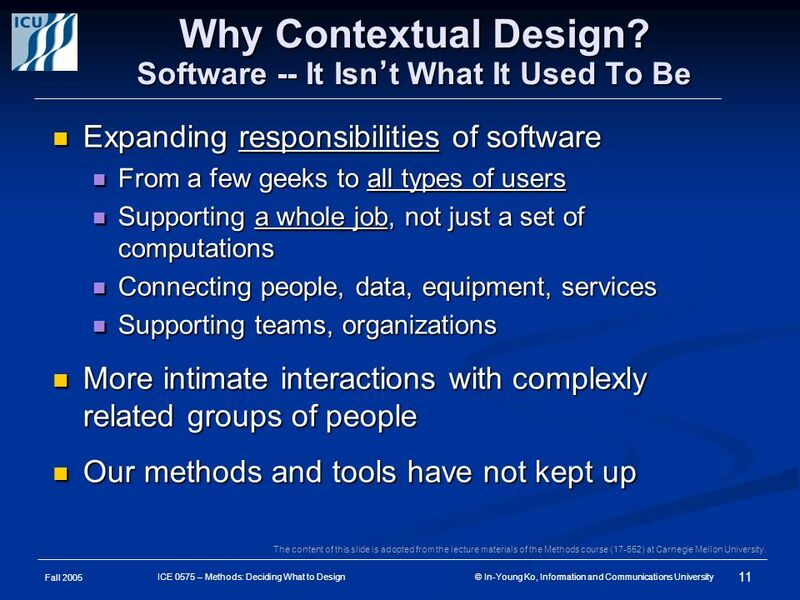 Why contextual design? Interviewing Interviewing The content of this slide is adopted from the lecture materials of the Methods course (17-652) at Carnegie Mellon University. 5 Fall 2005 5 ICE 0575 – Methods: Deciding What to Design © In-Young Ko, Information and Communications University Use Cases and Contextual Design Pedagogical sequence ≠ software life cycle sequence Pedagogical sequence ≠ software life cycle sequence e.g., use cases can fit relatively late within contextual design “ progression ” e.g., use cases can fit relatively late within contextual design “ progression ” Recognize when a technique will help Recognize when a technique will help What kind of problem will use cases help you solve? 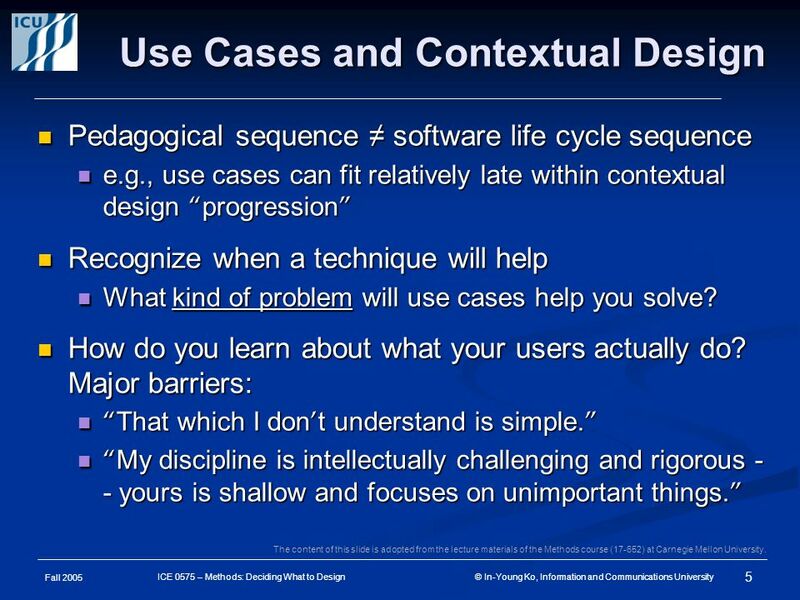 What kind of problem will use cases help you solve? 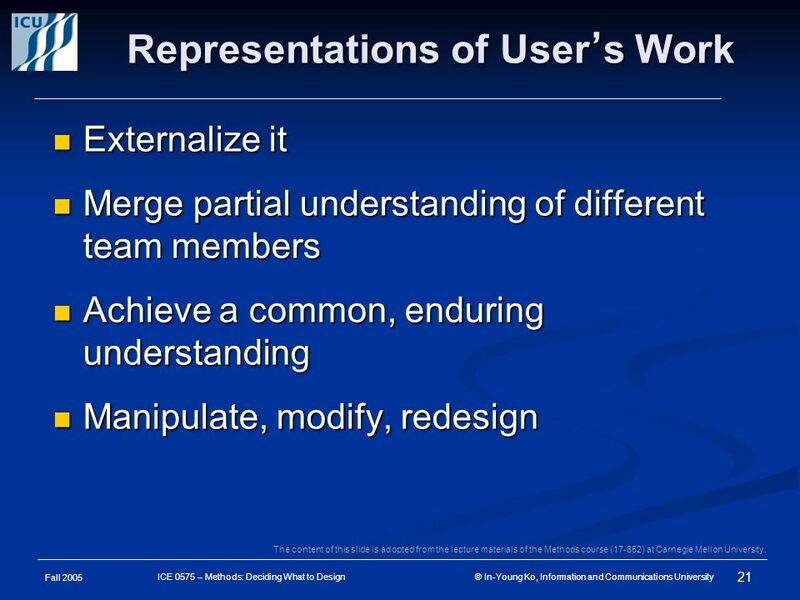 How do you learn about what your users actually do? Major barriers: How do you learn about what your users actually do? Major barriers: “ That which I don ’ t understand is simple. ” “ That which I don ’ t understand is simple. ” “ My discipline is intellectually challenging and rigorous - - yours is shallow and focuses on unimportant things. ” “ My discipline is intellectually challenging and rigorous - - yours is shallow and focuses on unimportant things. ” The content of this slide is adopted from the lecture materials of the Methods course (17-652) at Carnegie Mellon University. 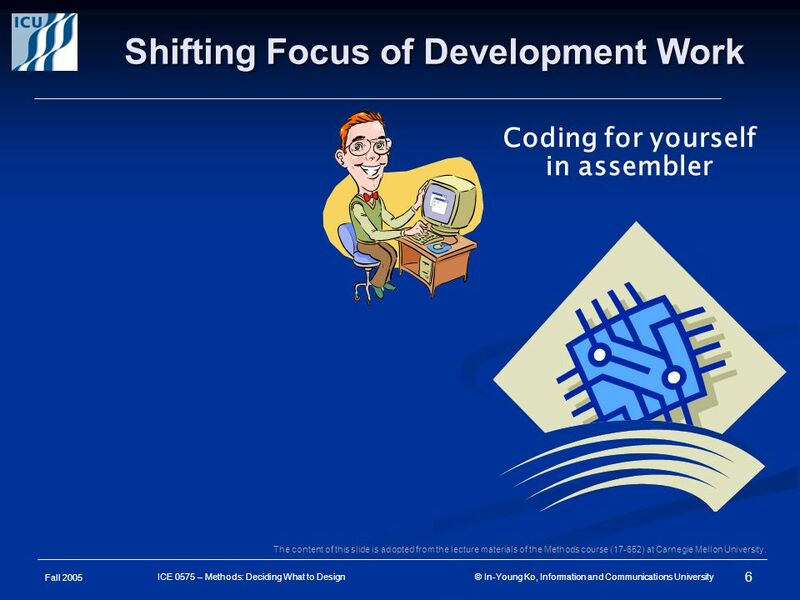 6 Fall 2005 6 ICE 0575 – Methods: Deciding What to Design © In-Young Ko, Information and Communications University Shifting Focus of Development Work Coding for yourself in assembler The content of this slide is adopted from the lecture materials of the Methods course (17-652) at Carnegie Mellon University. 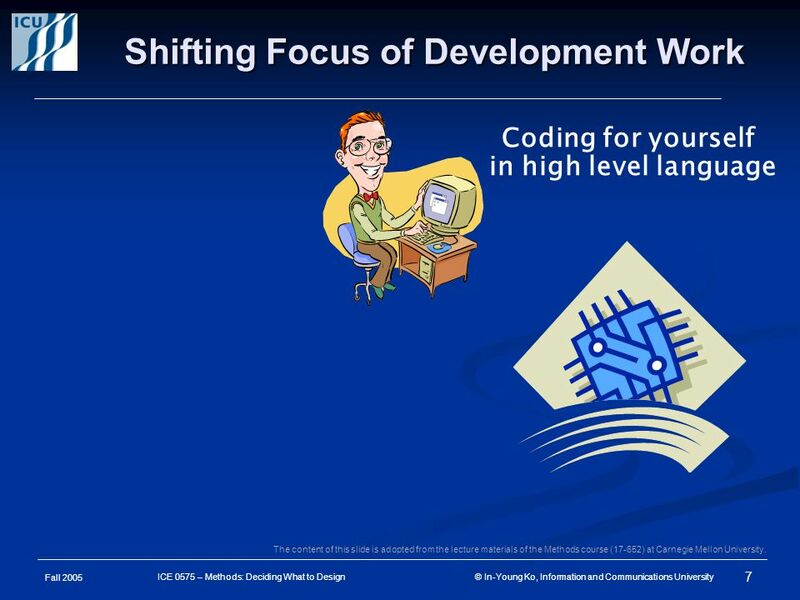 7 Fall 2005 7 ICE 0575 – Methods: Deciding What to Design © In-Young Ko, Information and Communications University Shifting Focus of Development Work Coding for yourself in high level language The content of this slide is adopted from the lecture materials of the Methods course (17-652) at Carnegie Mellon University. 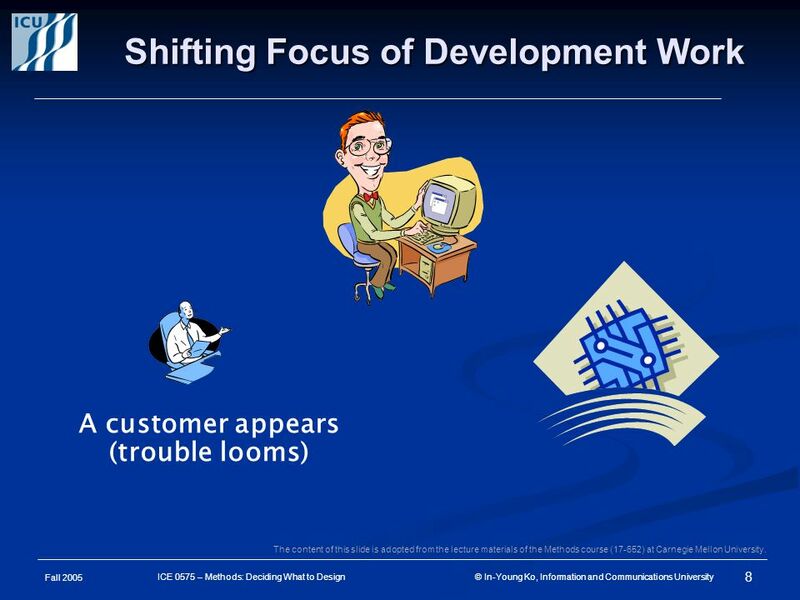 8 Fall 2005 8 ICE 0575 – Methods: Deciding What to Design © In-Young Ko, Information and Communications University Shifting Focus of Development Work A customer appears (trouble looms) The content of this slide is adopted from the lecture materials of the Methods course (17-652) at Carnegie Mellon University. 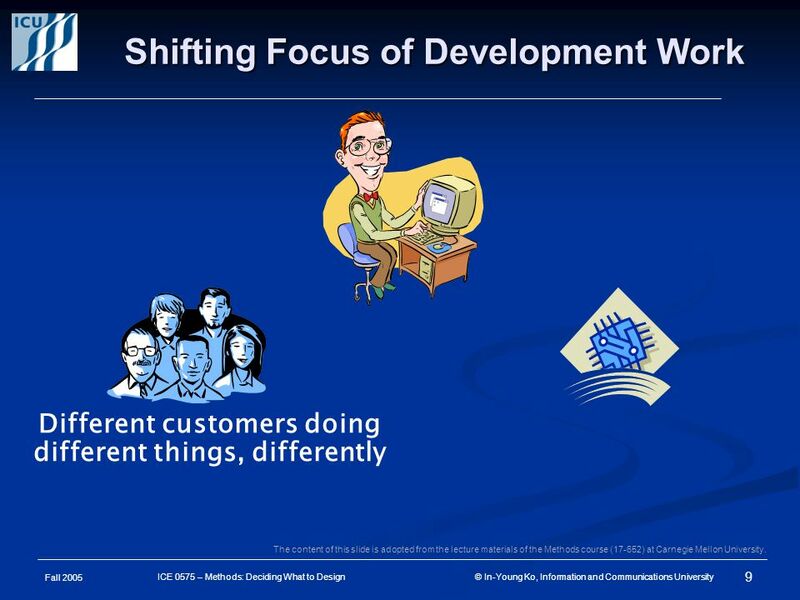 9 Fall 2005 9 ICE 0575 – Methods: Deciding What to Design © In-Young Ko, Information and Communications University Shifting Focus of Development Work Different customers doing different things, differently The content of this slide is adopted from the lecture materials of the Methods course (17-652) at Carnegie Mellon University. 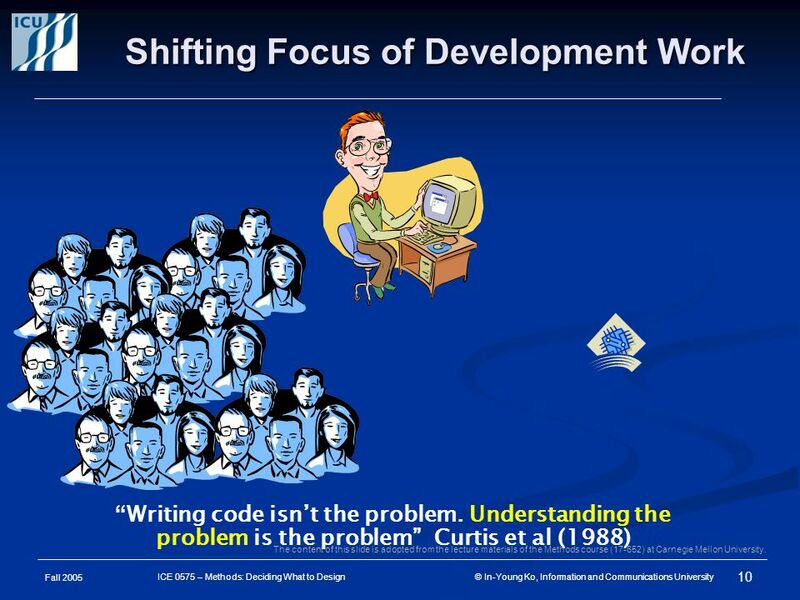 10 Fall 2005 10 ICE 0575 – Methods: Deciding What to Design © In-Young Ko, Information and Communications University Shifting Focus of Development Work “Writing code isn’t the problem. Understanding the problem is the problem” Curtis et al (1988) The content of this slide is adopted from the lecture materials of the Methods course (17-652) at Carnegie Mellon University. 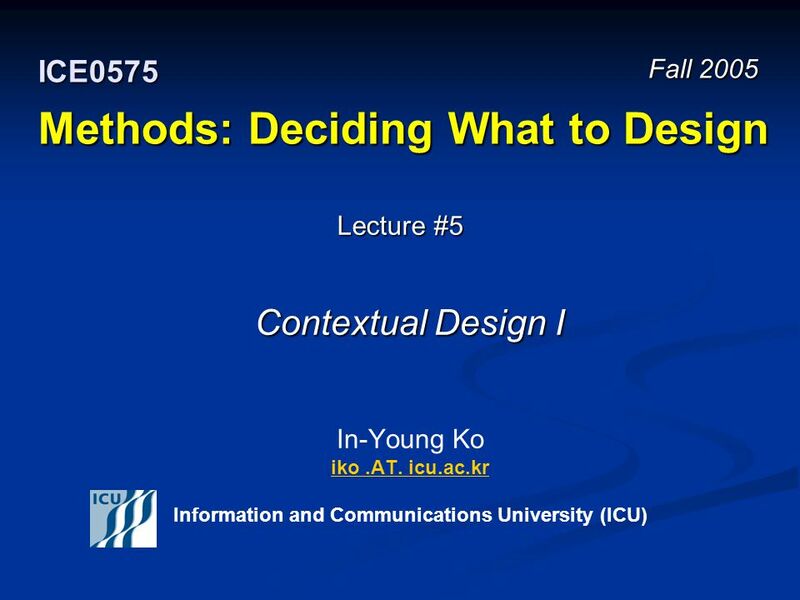 11 Fall 2005 11 ICE 0575 – Methods: Deciding What to Design © In-Young Ko, Information and Communications University Why Contextual Design? Software -- It Isn ’ t What It Used To Be Expanding responsibilities of software Expanding responsibilities of software From a few geeks to all types of users From a few geeks to all types of users Supporting a whole job, not just a set of computations Supporting a whole job, not just a set of computations Connecting people, data, equipment, services Connecting people, data, equipment, services Supporting teams, organizations Supporting teams, organizations More intimate interactions with complexly related groups of people More intimate interactions with complexly related groups of people Our methods and tools have not kept up Our methods and tools have not kept up The content of this slide is adopted from the lecture materials of the Methods course (17-652) at Carnegie Mellon University. 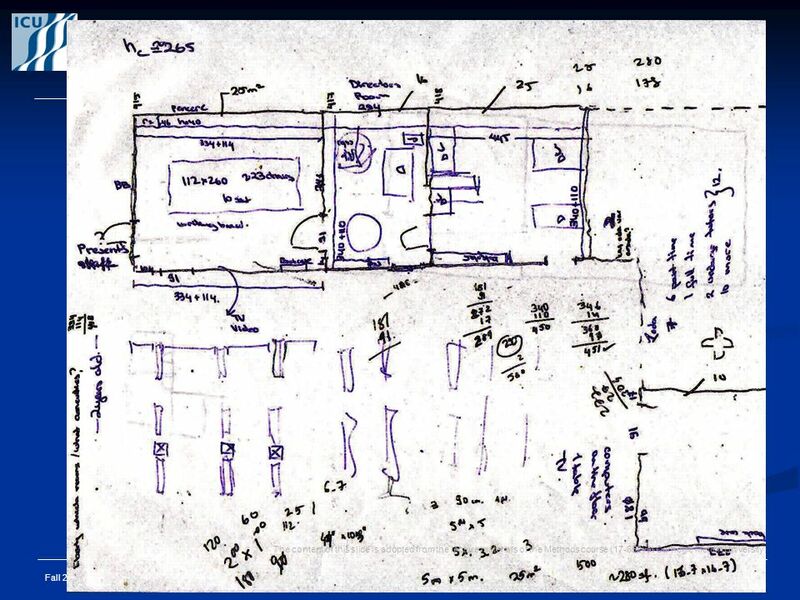 12 Fall 2005 12 ICE 0575 – Methods: Deciding What to Design © In-Young Ko, Information and Communications University Discovering, Representing Work We ’ re stuck in the old mold -- tell me what to build and I ’ ll build it We ’ re stuck in the old mold -- tell me what to build and I ’ ll build it In general, people can ’ t tell you what they really want In general, people can ’ t tell you what they really want A fish can ’ t describe water A fish can ’ t describe water Work becomes automatic, just react Work becomes automatic, just react Can ’ t fully grasp the technical possibilities Can ’ t fully grasp the technical possibilities The main thread of activity is often obvious The main thread of activity is often obvious It is the subtleties that will kill you It is the subtleties that will kill you Things that seem minor will often doom a project Things that seem minor will often doom a project You will often be designing how people work You will often be designing how people work Base design on data, not assumptions! 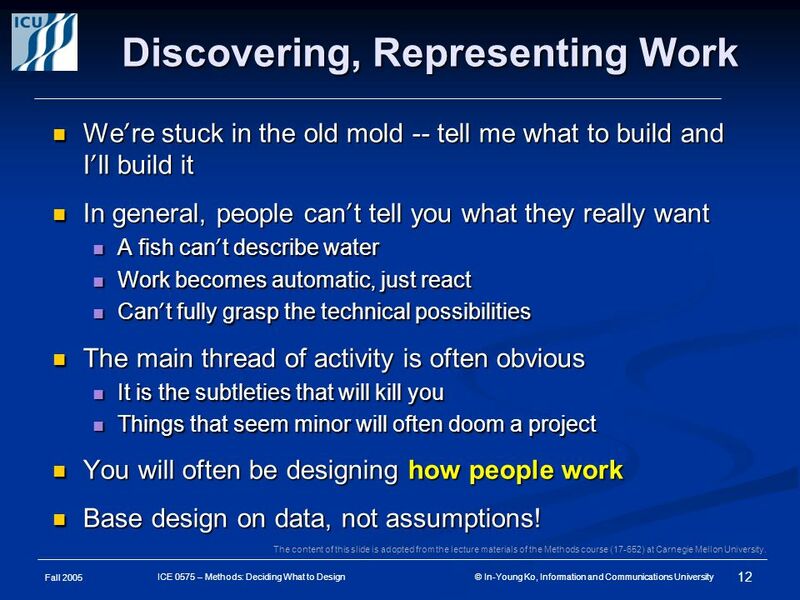 Base design on data, not assumptions! 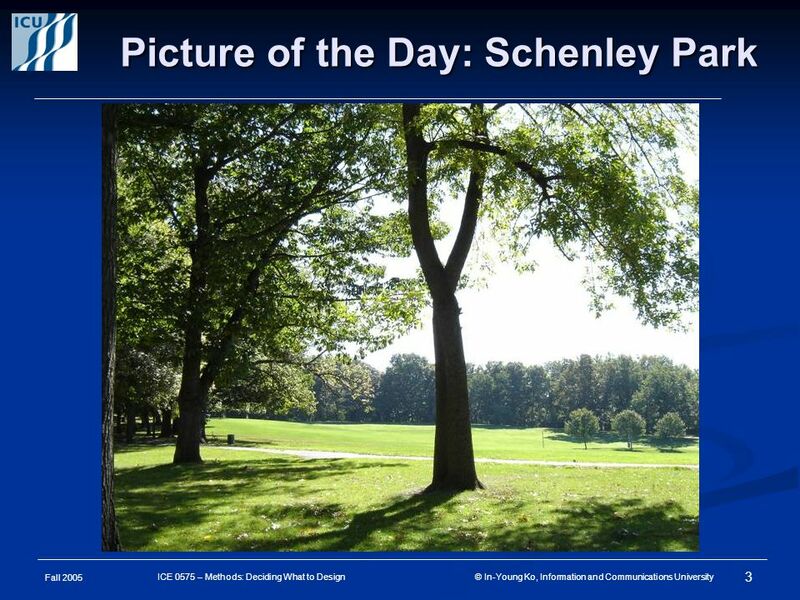 The content of this slide is adopted from the lecture materials of the Methods course (17-652) at Carnegie Mellon University. 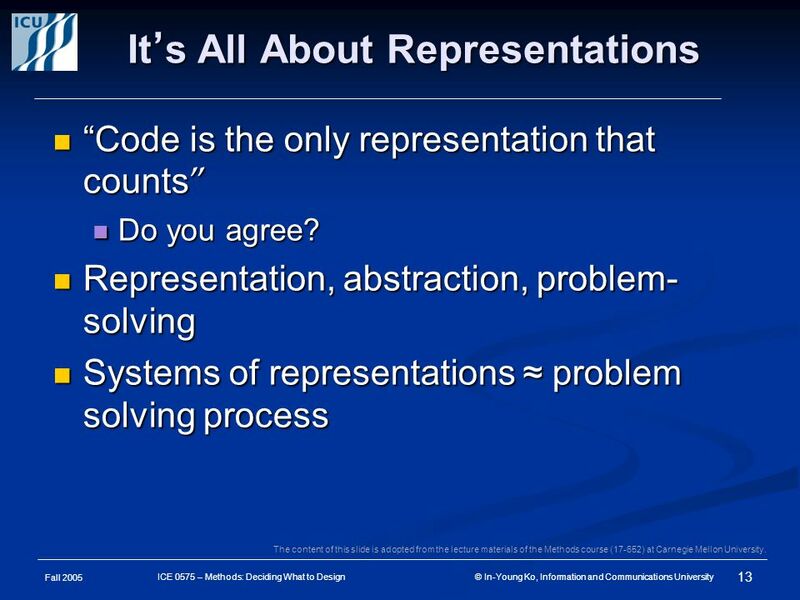 13 Fall 2005 13 ICE 0575 – Methods: Deciding What to Design © In-Young Ko, Information and Communications University It ’ s All About Representations “ Code is the only representation that counts ” “ Code is the only representation that counts ” Do you agree? Do you agree? Representation, abstraction, problem- solving Representation, abstraction, problem- solving Systems of representations ≈ problem solving process Systems of representations ≈ problem solving process The content of this slide is adopted from the lecture materials of the Methods course (17-652) at Carnegie Mellon University. 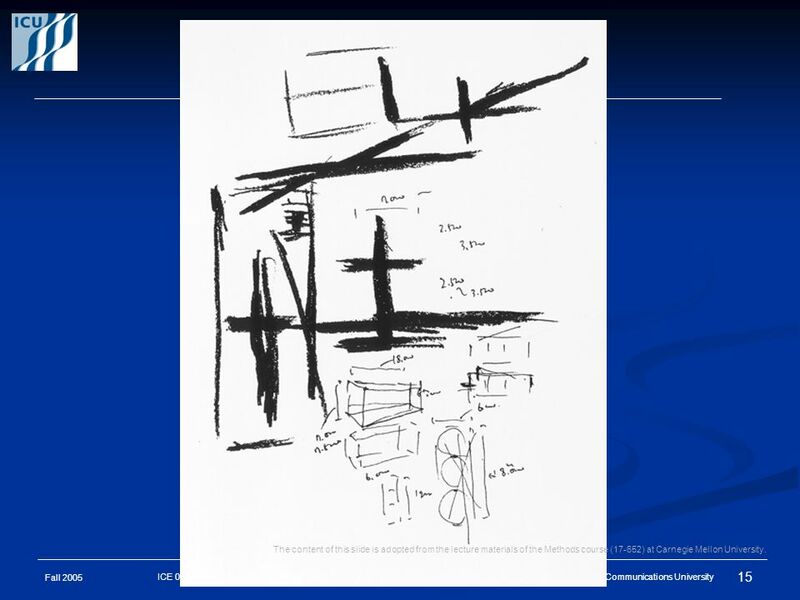 14 Fall 2005 14 ICE 0575 – Methods: Deciding What to Design © In-Young Ko, Information and Communications University Representations Shape Problem-Solving “ Solving a problem simply means representing it so as to make the solution transparent. 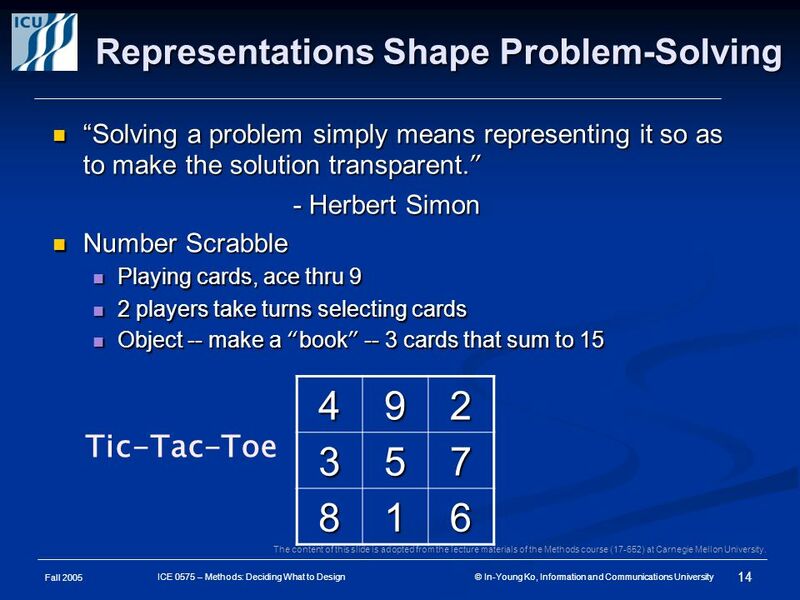 ” “ Solving a problem simply means representing it so as to make the solution transparent. ” - Herbert Simon - Herbert Simon Number Scrabble Number Scrabble Playing cards, ace thru 9 Playing cards, ace thru 9 2 players take turns selecting cards 2 players take turns selecting cards Object -- make a “ book ” -- 3 cards that sum to 15 Object -- make a “ book ” -- 3 cards that sum to 15 492 357 816 Tic-Tac-Toe The content of this slide is adopted from the lecture materials of the Methods course (17-652) at Carnegie Mellon University. 15 Fall 2005 15 ICE 0575 – Methods: Deciding What to Design © In-Young Ko, Information and Communications University The content of this slide is adopted from the lecture materials of the Methods course (17-652) at Carnegie Mellon University. 16 Fall 2005 16 ICE 0575 – Methods: Deciding What to Design © In-Young Ko, Information and Communications University The content of this slide is adopted from the lecture materials of the Methods course (17-652) at Carnegie Mellon University. 17 Fall 2005 17 ICE 0575 – Methods: Deciding What to Design © In-Young Ko, Information and Communications University The content of this slide is adopted from the lecture materials of the Methods course (17-652) at Carnegie Mellon University. 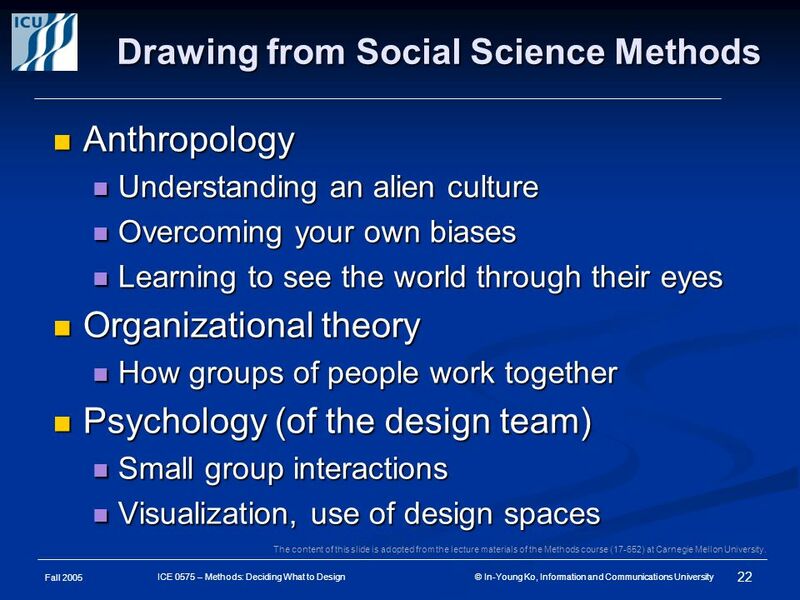 18 Fall 2005 18 ICE 0575 – Methods: Deciding What to Design © In-Young Ko, Information and Communications University The content of this slide is adopted from the lecture materials of the Methods course (17-652) at Carnegie Mellon University. 19 Fall 2005 19 ICE 0575 – Methods: Deciding What to Design © In-Young Ko, Information and Communications University The content of this slide is adopted from the lecture materials of the Methods course (17-652) at Carnegie Mellon University. 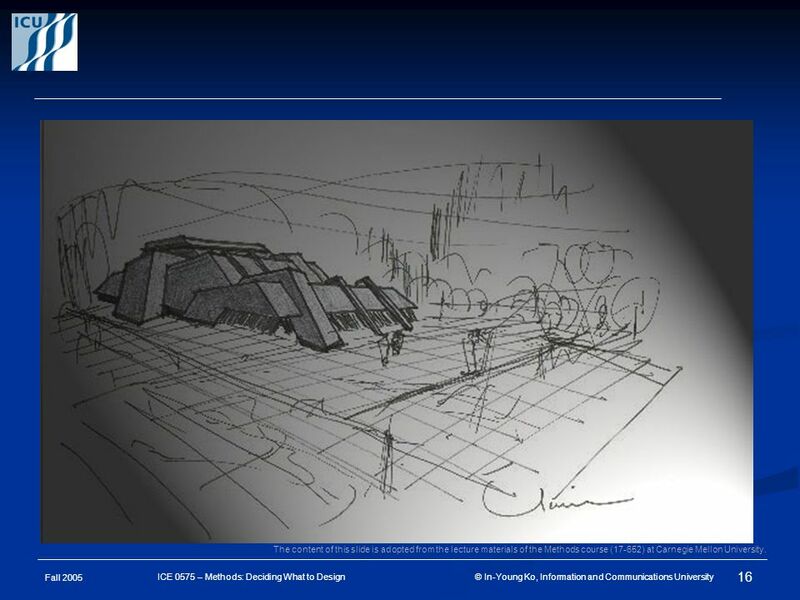 20 Fall 2005 20 ICE 0575 – Methods: Deciding What to Design © In-Young Ko, Information and Communications University The content of this slide is adopted from the lecture materials of the Methods course (17-652) at Carnegie Mellon University. 21 Fall 2005 21 ICE 0575 – Methods: Deciding What to Design © In-Young Ko, Information and Communications University Representations of User ’ s Work Externalize it Externalize it Merge partial understanding of different team members Merge partial understanding of different team members Achieve a common, enduring understanding Achieve a common, enduring understanding Manipulate, modify, redesign Manipulate, modify, redesign The content of this slide is adopted from the lecture materials of the Methods course (17-652) at Carnegie Mellon University. 22 Fall 2005 22 ICE 0575 – Methods: Deciding What to Design © In-Young Ko, Information and Communications University Drawing from Social Science Methods Anthropology Anthropology Understanding an alien culture Understanding an alien culture Overcoming your own biases Overcoming your own biases Learning to see the world through their eyes Learning to see the world through their eyes Organizational theory Organizational theory How groups of people work together How groups of people work together Psychology (of the design team) Psychology (of the design team) Small group interactions Small group interactions Visualization, use of design spaces Visualization, use of design spaces The content of this slide is adopted from the lecture materials of the Methods course (17-652) at Carnegie Mellon University. 23 Fall 2005 23 ICE 0575 – Methods: Deciding What to Design © In-Young Ko, Information and Communications University Contextual Design Overview Contextual inquiry Contextual inquiry Work Modeling Work Modeling Consolidation Consolidation Work redesign Work redesign User environment design User environment design Prototyping and feedback Prototyping and feedback This is “ a ” method, not “ the ” method! This is “ a ” method, not “ the ” method! 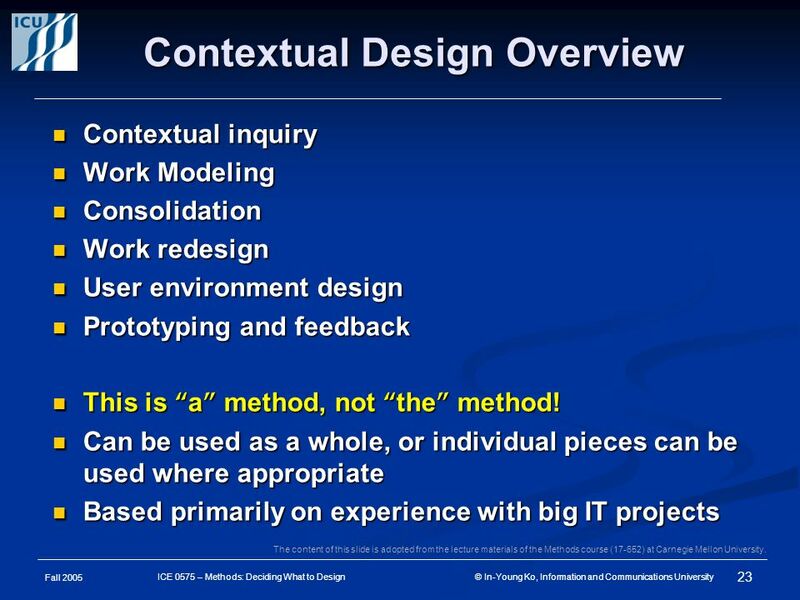 Can be used as a whole, or individual pieces can be used where appropriate Can be used as a whole, or individual pieces can be used where appropriate Based primarily on experience with big IT projects Based primarily on experience with big IT projects The content of this slide is adopted from the lecture materials of the Methods course (17-652) at Carnegie Mellon University. 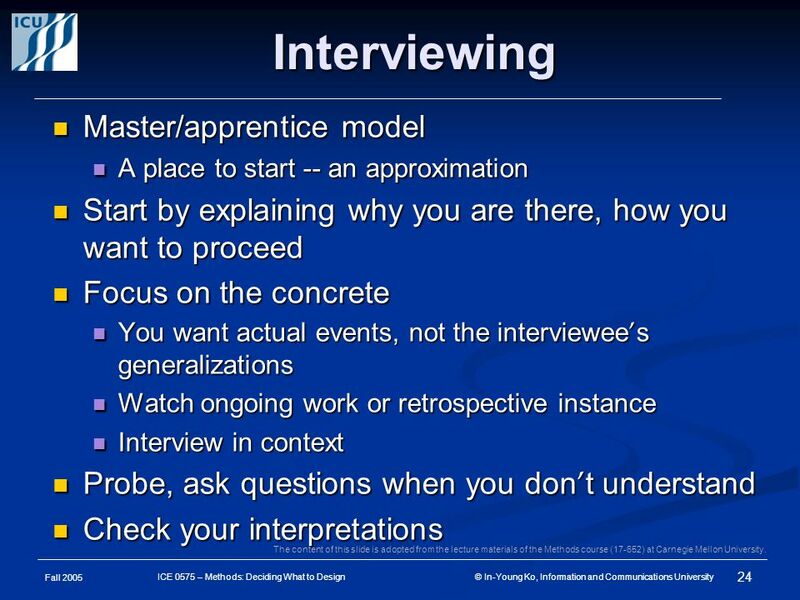 24 Fall 2005 24 ICE 0575 – Methods: Deciding What to Design © In-Young Ko, Information and Communications University Interviewing Master/apprentice model Master/apprentice model A place to start -- an approximation A place to start -- an approximation Start by explaining why you are there, how you want to proceed Start by explaining why you are there, how you want to proceed Focus on the concrete Focus on the concrete You want actual events, not the interviewee ’ s generalizations You want actual events, not the interviewee ’ s generalizations Watch ongoing work or retrospective instance Watch ongoing work or retrospective instance Interview in context Interview in context Probe, ask questions when you don ’ t understand Probe, ask questions when you don ’ t understand Check your interpretations Check your interpretations The content of this slide is adopted from the lecture materials of the Methods course (17-652) at Carnegie Mellon University. 25 Fall 2005 25 ICE 0575 – Methods: Deciding What to Design © In-Young Ko, Information and Communications University Interview Tips Have to have a balance between Have to have a balance between Maintaining focus in order to collect relevant data Maintaining focus in order to collect relevant data Capturing important but unexpected information Capturing important but unexpected information Focus statement visible in notes, e.g., Focus statement visible in notes, e.g., For ordering system, “ How people find out about, decide on, and make requests for the things they need to do their work. ” For ordering system, “ How people find out about, decide on, and make requests for the things they need to do their work. 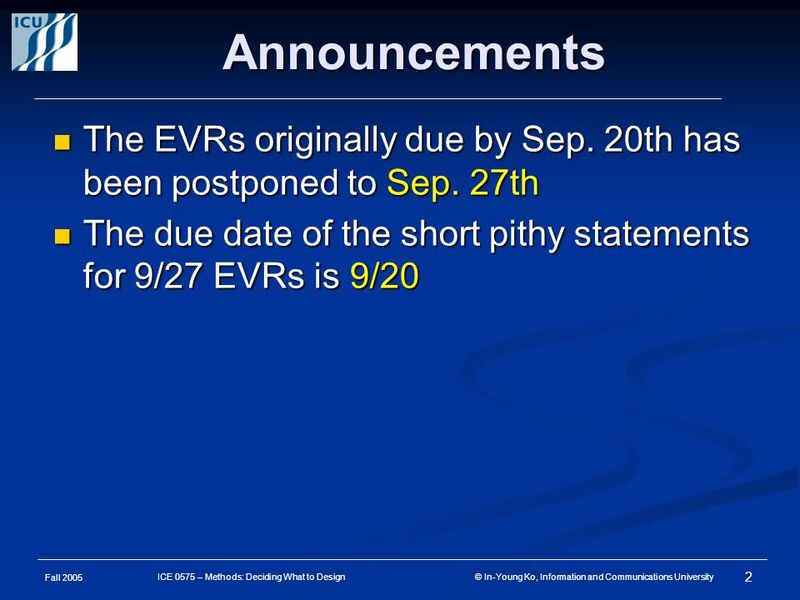 ” What kinds of focus statements might you have for your interviews? What kinds of focus statements might you have for your interviews? 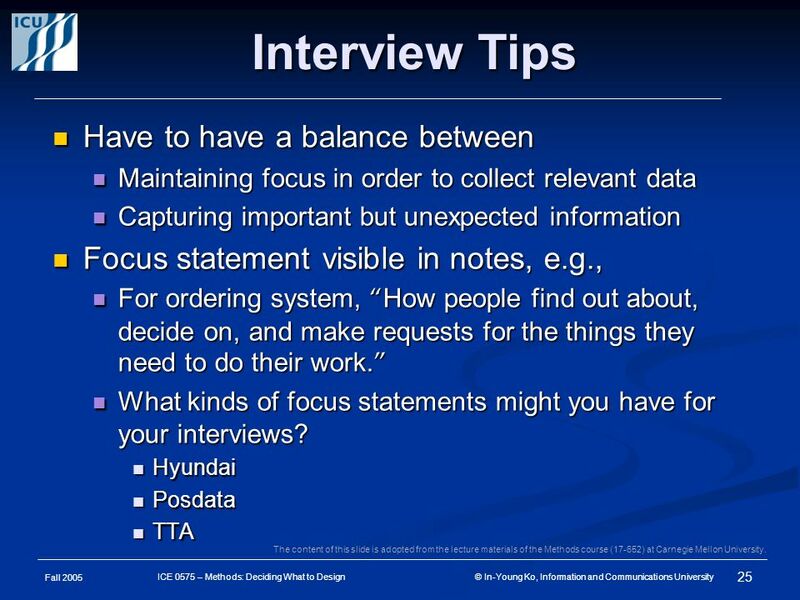 Hyundai Hyundai Posdata Posdata TTA TTA The content of this slide is adopted from the lecture materials of the Methods course (17-652) at Carnegie Mellon University. 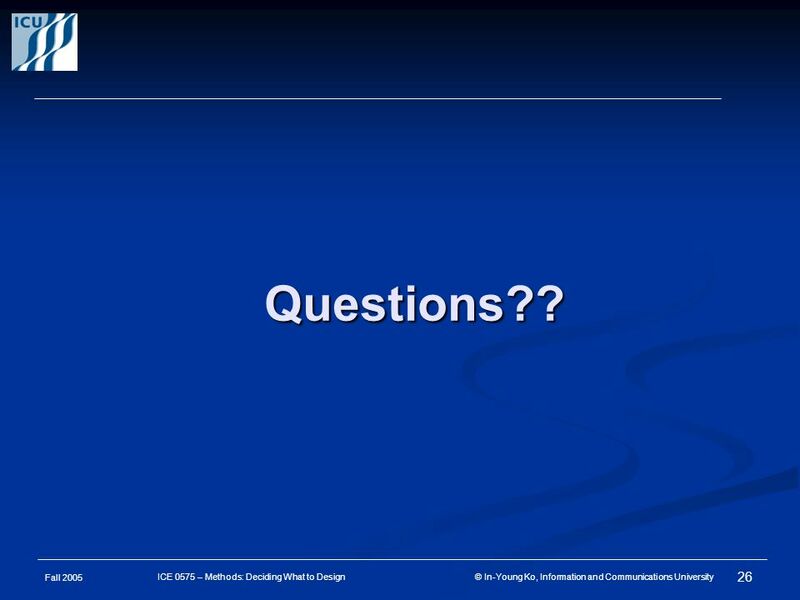 26 Fall 2005 26 ICE 0575 – Methods: Deciding What to Design © In-Young Ko, Information and Communications University Questions?? 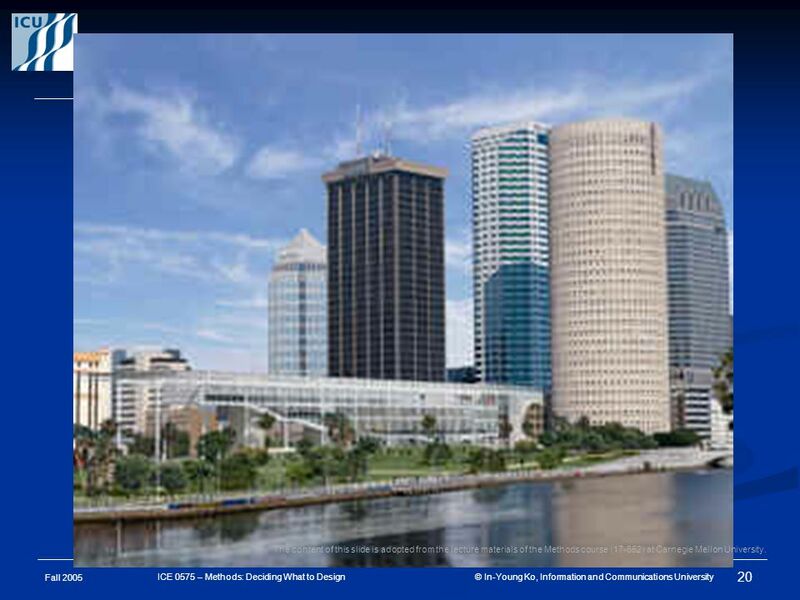 Download ppt "Methods: Deciding What to Design In-Young Ko iko.AT. icu.ac.kr Information and Communications University (ICU) iko.AT. icu.ac.kr Fall 2005 ICE0575 Lecture." 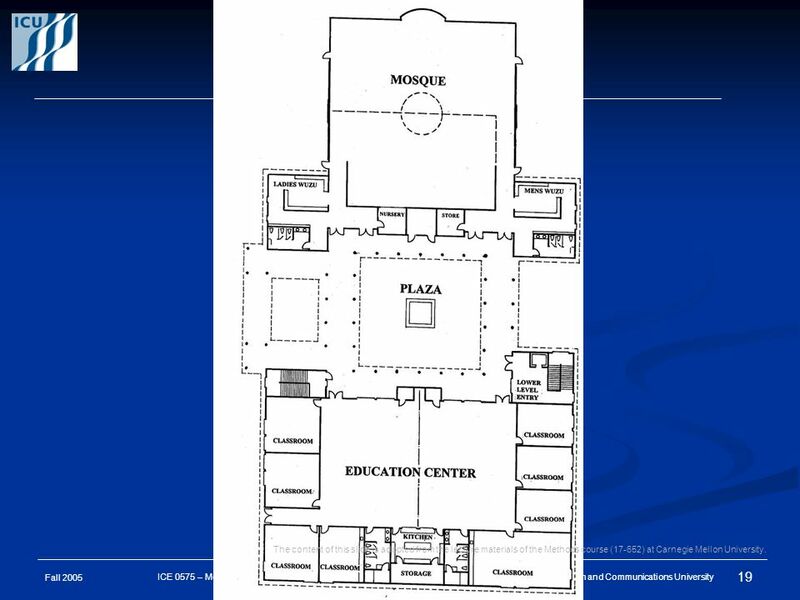 1 of 35 Dr. Anne Adams Esteem Dissemination.